Quick update – I have removed the ‘non-commercial use’ restriction from Jame5’s license and forked it as a wiki . Yesterday I took delivery of 500 copies of Jame5 as 188 page paperback. The quality is good and I am happy with how the print turned out – nice. If you prefer the paperback over the PDF feel free to buy a copy – the content is identical. As to the price I will charge 29.99 Euro plus 3 Euro postage and packing to any destination worldwide. So for a grand total of 32.99 Euro you can own you very own first edition Jame5! As to forms of payment I will accept bank transfer inside the European Union and PayPal from the rest of the world – no money orders, sorry. Feel free to drop me an email and I will give you the payment details. Include a desired dedication and I will be happy to oblige. Letting me know your shipping address should not hurt as well. Having been introduced to the concept of the Singularity by reading the works of such brilliant authors as Ray Kurzweil and Charles Stross about 2 years ago I started to wonder how a super intelligent artificial intelligence would reason about good and evil. 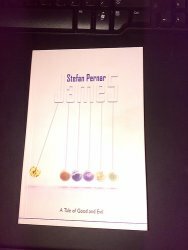 The result is the book “Jame5 – A Tale of Good and Evil”. Jame5 is a “Sophie’s World” for futurists and singularitarians in which I take you trough a hard take off technical singularity with all its philosophical consequences. What is good and what is evil? Where are we coming from and where are we going? What are happiness and the meaning of life? What do prophets have in common with dictators? All of these questions and more are being touched in Jame5 and in the end form my very personal description of the world and the future. Thanks to Micha’s support the Jame5 blog is life and well. Great! My first post on my first blog about my first book – good stuff.